Even the people who live in Illinois don't always agree on just one thing that makes the state so special. You can explore the world-class attractions and exciting nightlife of Chicago, or experience the presidential history of Springfield, home to more Abraham Lincoln landmarks than anywhere else in the country. Illinois also has a well-preserved stretch of Route 66, where classic diners and quirky roadside attractions still dot the landscape. Wherever you go, you’ll be greeted with Midwestern hospitality. Grant Park, otherwise known as Chicago’s front lawn, has been one of America’s greatest civic spaces for over a century, and it’s still a work in progress. Since its establishment in 1844, it’s been enhanced by additions such as the Art Institute of Chicago and the beloved Buckingham Fountain. More recently, it’s been further transformed with the addition of the Museum Campus and Millennium Park, a sweeping redevelopment of a railway yard at the north end. 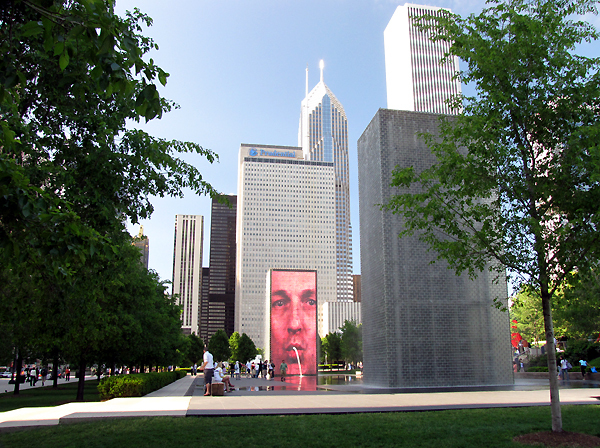 Spearheaded by Mayor Richard M. Daley, the hugely ambitious 24-acre Millennium Park was plagued by delays and costly over-expenditure, but what a beauty it turned out to be. An estimated 300,000 people turned up for the inaugural festivities in 2004, and the park has remained wildly popular since. 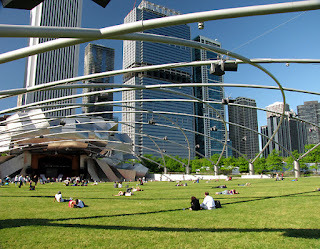 Its centrepiece is the Jay Pritzker Pavilion, a stunning band shell named in memory of the philanthropist and Hyatt Hotels founder who, with his wife, Cindy, established architecture’s most prestigious prize in 1979. Honours for the pavilion design went to 1989 Pritzker Prize winner Frank Gehry, and its exterior bears his signature billowing sheets of stainless steel. A steel trellis, which holds a state-of-the-art speaker system, extends over 4,000 fixed seats and the Great Lawn (with space for 7,000), distributing indoor-quality sound to the farthest reaches of the audience. 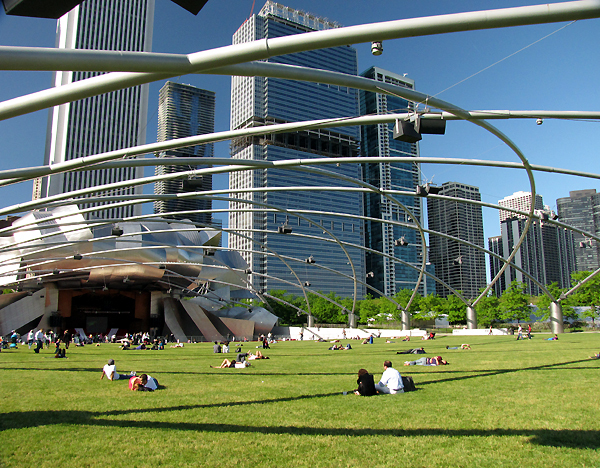 The resident Grant Park Orchestra gives free summer time concerts, just as it has done in the park since the 1930s, and the adjacent Harris Theater provides indoor music and dance programmes. 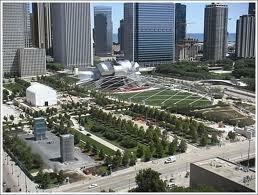 Two of Millennium Park’s top attractions are major additions to Chicago’s collection of public art. Anish Kapoor’s 110-ton 33-by-66-foot ‛Cloud Gate’ dominates AT&T Plaza, offering ‘house of mirror’ reflections of sky, skyline and spectators in its highly polished steel surface. 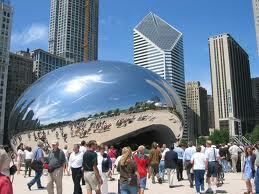 (Chicagoans call it by the more tangibly descriptive nickname ‘The Bean’.) South of the plaza is the Crown Fountain by Spanish artist Jaume Plensa, which features two 50-foot glass towers on either side of a very shallow reflecting pool. LED screens behind the glass blocks display faces of Chicago citizens from a broad social spectrum; in an ingenious twist on the traditional use of gargoyles in fountains, spouts in the glass walls convey the illusion of water issuing from the images’ mouths. At the northwest corner of the park is the Millennium Monument, a replica of the semi-circular colonnade, or peristyle, that sat on this same spot from 1917 to 1953. 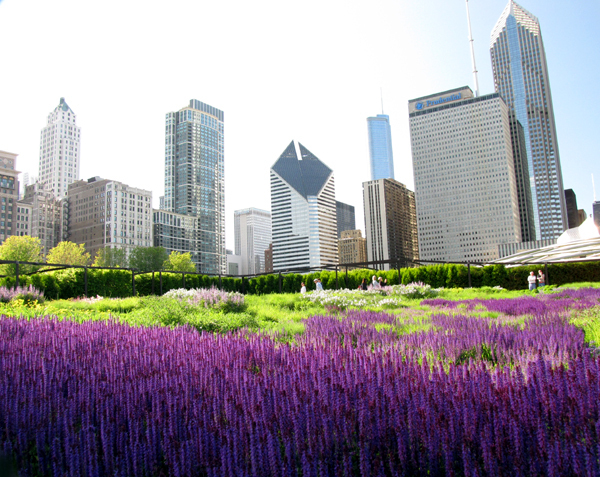 At the opposite corner is the Lurie Garden, a lush urban retreat with shrubs, grasses, flowering plants, a canal and walkways. 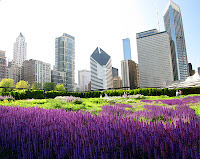 Designed by Kathryn Gustafson, the garden is meant to reflect the city’s natural and cultural history, and the 15-foot ‘shoulder’ hedge evokes Carl Sandburg’s famous description of Chicago as the ‘City of Big Shoulders’.